Samsung is about to launch a new smartphone, the rugged and highly durable Galaxy S8 Active. The first press renders of the phone has leaked online and the phone duly justifies the claims made by the company so far. The leak comes from a trusted source and they have always been at the forefront when it comes to leaking phone renders much before their official launch. 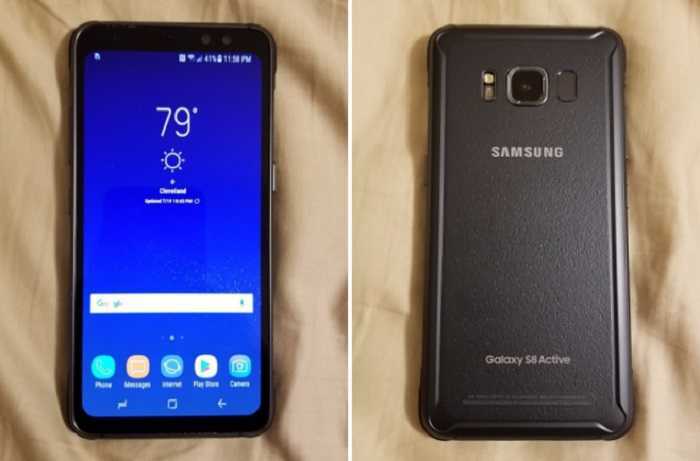 The slides shown by EvLeaks shows a typical Samsung design albeit with no buttons on the bottom. It is the sides of the smartphone that is going to capture the attention of many because they are promptly covered with strong rubber coating. The actual material used in the sides cannot be confirmed now but they look like a mixture of rubber and plastic so that it is easy to hold them when using the phone in public spots. A lot of smartphones released these days including the flagship Galaxy S8 and S8 Plus by Samsung are too thin that they could easily slip off hands if you are not careful. It is great to see the manufacturer focusing on device that you could rely on for years and it will still run efficiently because of the robust build quality. 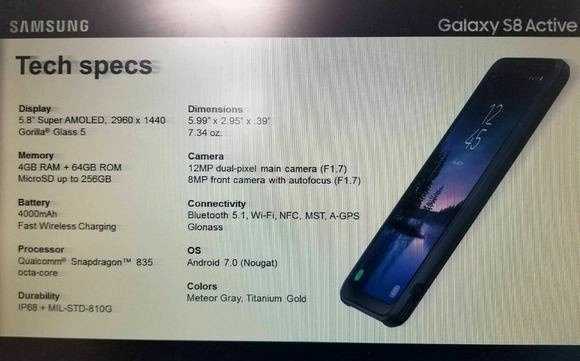 Along with the leaked photos, the press slide also showcased the actual specifications of the Samsung Galaxy S8 Active smartphone. It features a large 5.8-inch display with a resolution of 2960 x 1440. The Super AMOLED display which is a proprietary design of the company is sure to look exceptionally bright and good looking when it comes to browsing the internet, Youtube videos or games. The phone uses Corning Gorilla Glass 5 one of the best in recent times for protecting the display. Under the metal shell, it is powered by Qualcomm Snapdragon 835 processor coupled with Adreno 540 GPU and 4GB of RAM. The phone has 64GB of storage space which is more than enough for most users but you do have the option to expand it with micro SD card. The device has 12 megapixel dual pixel rear camera with LED flash and an 8 megapixel front facing camera. All the basic sensors are in the phone. The Samsung Galaxy S8 Active is also water and dust resistant with a total weight of 270 grams. It is powered by a 4,000 mAh battery and has fast charging capabilities to take it from 0 to 60 percent in just 15 minutes. The phone has Wifi 802.11 AC and all the latest wireless connectivity options.